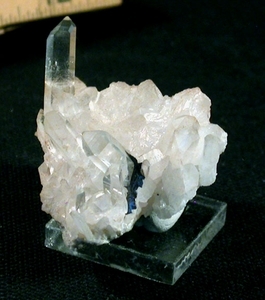 Brookite, a polymorph of titanium dioxide, had found its' way to Collier's Creek mine, and produced a fine shiny blade nearly bisecting, and extending out of, one of the crystal members of this highly unusual minature sized quartz cluster. This stuff JUST isn't found inside the Montgomery County Lines - but here it is. Brookite is VERY rare for Arkansas, and this is a superb example. The intersected point and another have 8 faces - extremely rare. The tallest, and tabular crystal, has NINE faces. There's a diminutive extra rare dogtooth crystal to its' left, too. Add the brookite and it's an over-the-top piece! Clean, sparkly pale grey sandstone matrix. Nine or ten crystals are actively regrowing - no damage. At 1-5/8"x 2"x up to 1-3/4" tall overall for your cabinet of curiosities, with the exposed portion of brookite being 3/16"x 1/2".